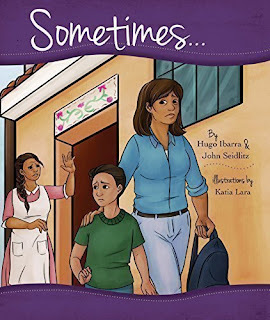 Written by Texas elementary school teacher Hugo Ibarra and expert ELL educator John Seidlitz, Sometimes is their first children's picture book, which addresses the problems and challenges kids may face as new immigrants to the U.S. The story is based on Ibarra’s own immigration experience and first-hand accounts from real students and their parents. Learn more about the book below and see how you can get a copy. Sometimes follows the journey of Andrés and his sister, Clara, as they immigrate from Mexico to the United States. They see many strange sights for the first time -- the border filled with cars, a strange U.S. town -- and wonder why they had to leave their mother behind. As Andrés starts at a new school, he receives encouragement from a beloved teacher, buoying his hopes until he and his sister are finally reunited with their mother. Get your own copy at Amazon.com. The book features realistic, colorful illustrations and easy-to-follow text with the right difficulty level and length for its intended readers, i.e. children ages 4-8. I like that the story is told from the perspective of Andrés, the little boy undergoing significant changes in life, which makes the story sound more authentic and relatable for young readers. It brings up many issues that affect children in transition, including separation anxiety, language barrier, adjustment to an entirely new environment, and how to deal with uncertainties. It has a clear focus on the positive role that a caring teacher can play in helping children make a smooth transition and giving them courage, strength and hope. The book concludes with a happy ending and an encouraging but not overly optimistic message that dreams do come true...sometimes. There are quite a few questions that remain unanswered in the book though. For instance, what on earth had happened to the children's dad? Why was he unable to return home or take care of the kids after they moved to Texas? Why did Aunt Elena take the kids to the U.S. in such a hurry but have to leave their mother behind? Why did she burst into tears after they went through border control? I wish the authors could write a sequel or companion book to fill in those missing details so that the story could become more complete and interesting. Hugo Ibarra immigrated to the United States when he was 25. After studying immigrant children for his thesis, he received a Masters of Education in Educational Leadership from The University of Texas at Tyler and began his career as a Bilingual Education Teacher in Longview, Texas. Ibarra is currently an elementary school principal in Bryan, Texas. John Seidlitz is founder and CEO of Seidlitz Education, a company that provides training and support to educators and leaders of English Language Learner programs across the state of Texas and beyond. John began his work with ELLs as a social studies teacher, after which he served as a program coordinator, and a regional education specialist. He has authored several books, including: 7 Steps to Developing a Language-Rich Interactive Classroom™ and Sheltered Instruction Plus: A Guide for Texas Teachers of English Learners. Sometimes is his first children's book. Disclosure: I received a free copy of this book to facilitate my honest review. All views and opinions expressed are my own.